Can I charge a one-time fee to a merchant without creating him as a recurring debit customer? You can charge one-time fees (or credits) to a merchant WITHOUT setting him up as customer that makes recurring payments. This might be necessary with deals that you broker but do not fund, so do not collect recurring transactions on. One-time payments will be processed by ACH Works at the their standard time 7pm Eastern which means the merchant will not see it until the next day. Please contact ACH Works for their processing cutoff times. 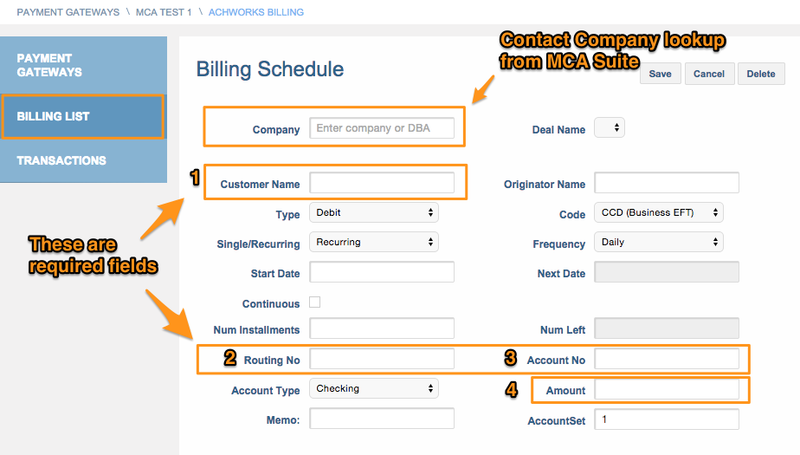 If you want to set up a customer so you can run one-time payments for them (but are not going to be debiting them on a recurring basis), set up them up as you might usually do on the Payment Gateways > ACH Works > Add New Billing Schedule page. [Even if you are just brokering this deal, it must still be tracked in the system, so that you can select from the "Deal Name" field on this page]. 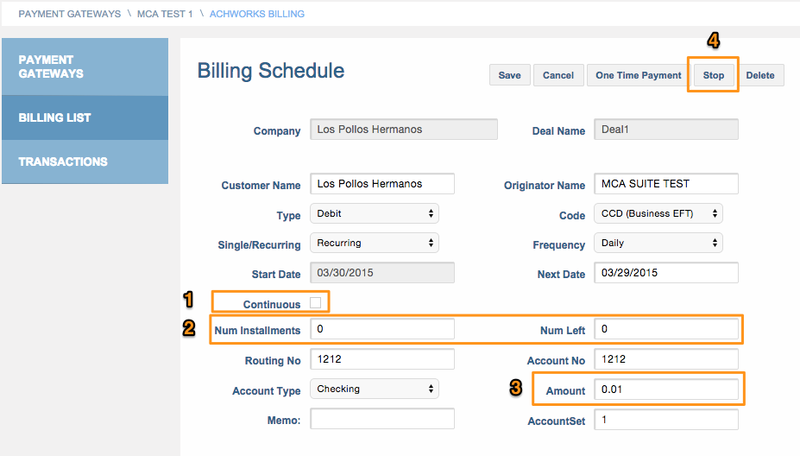 4) after you create the customer, click the "Stop" button to disable the schedule. This will ensure that no recurring payment is made mistakenly. Once you have taken these steps, you are ready to charge the customer the one-time fee. To do this, go to the "One Time Payment" button. Select the transaction type (select debit if you want to charge a fee, or credit if you want to issue a discount), enter the amount of the payment and make sure the "Apply to Deal" check box is unchecked. Click save and your one-time fee will be sent to ACH Works immediately.